3/4 Inch Diamond Plus Hole Saw Choose the Milwaukee<sup></sup> Diamond Plus Hole Saw for up to 10X longer life when cutting tile, stone and glass. Diamond Plus Hole Saws deliver best-in-class performance, with higher grade diamonds for maximum heat and fracture resistance. An improved braze provides superior diamond retention when cutting hard, abrasive materials. The One-Piece Hole Saw has a 1/4" quick change hex shank and features a large slug ejection slot. Designed as the single cutting solution for all tile, stone, and glass applications, Diamond Plus offers the lowest cost-per-hole on the market. 3/4 Inch Diamond Plus Hole Saw is rated 4.7 out of 5 by 60. Rated 5 out of 5 by Knowseeker from Did a fine job. I used some water as... Did a fine job. I used some water as a lubricant to cut through the ceramic tile…. Rated 5 out of 5 by DRP from Greats drill bit I have ever bought. Use with water... Greats drill bit I have ever bought. Use with water for best results!! Rated 5 out of 5 by TedR from This hole saw is very fast cutting. No jagged... This hole saw is very fast cutting. No jagged edges. I plan to get a couple of other sizes. 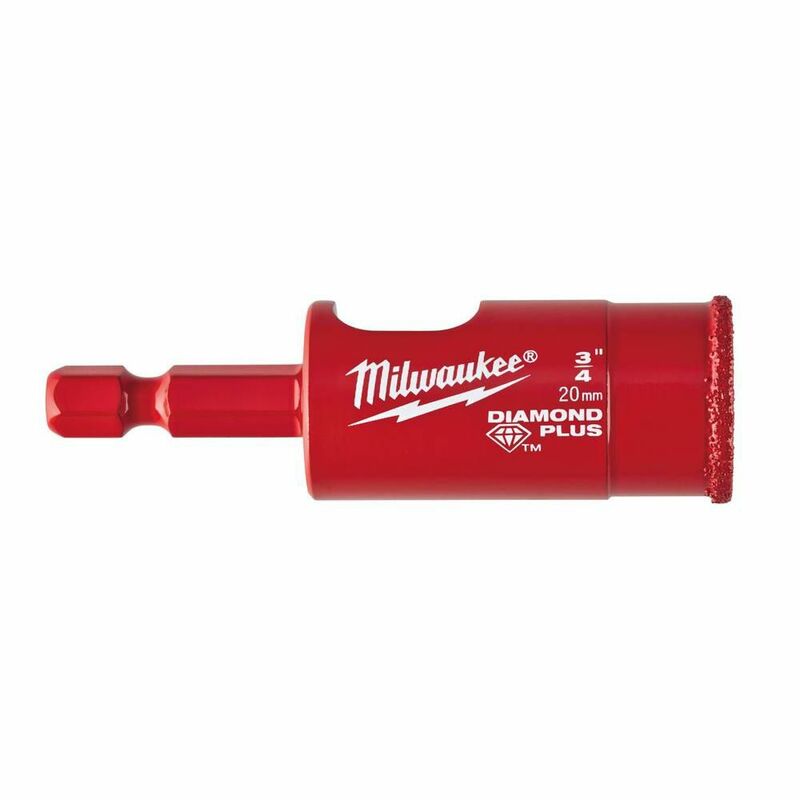 Rated 5 out of 5 by Tribilitate from The Milwaukee diamond bit has out performed all of its... The Milwaukee diamond bit has out performed all of its competitors giving us the ability and confidence to complete our jobs in a timely manner . The diamond bit has a clean / concise cutting edge above the rest . As a business this tool comes highly recommended . Rated 5 out of 5 by gasman8146 from The directions on how to use the cutter were spot... The directions on how to use the cutter were spot on and the tool worked extremely well.